to create delicate feminine pieces for all occasions. 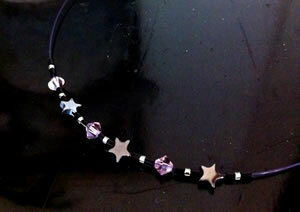 Purple tigertail necklace with moving Hematite Stars and purple Swarovski crystals. 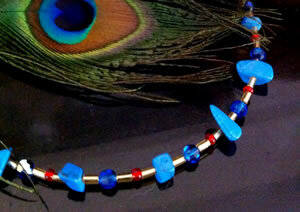 Fully beaded Turquoise stone and Royal Blue Swarovski crystals necklace. 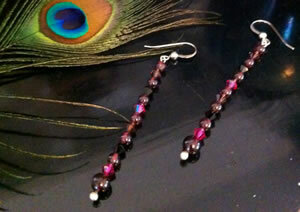 Garnet drop earrings with Cerise and Wine Swarovski crystals. 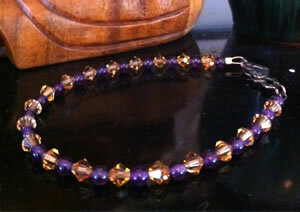 Amethyst polished round beads and toffee Swarovski crystals, finished with a silver heart clasp. All findings are Sterling silver unless otherwise stated.